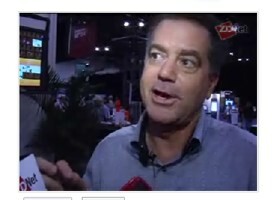 David Berlind, writer for ZDNet.com, has posted a video interview with Palm CEO Ed Colligan to his blog, discussing both Palm’s new Centro smartphone and their cancelled Linux-based Foleo subnotebook. The interview questions consist of a mix of predictable and interesting topics, with Colligan doing most of the talking and issuing the anticipated responses to most questions. Some of the topics addressed during the interview by Colligan include the Centro targeting cheap featurephone competition as well as the fact that all of the various forms of smartphones comprise only “5%” of the market’s annual sales. The low price point of the Centro is attributed to Palm “doing it in partnership” with Sprint with no mention of cost-reduced component integration, specification reduction, or reduced margins on the device from Palm. I did notice two more interesting observations from watching the full interview. The first was the fact that Colligan casually mentions the iPhone in the same breath as the Treo line and RIM’s BlackBerry devices in regards to competing smartphones on the market. Within the textual area of Berlind’s blog post he mentions the fact that he is wary of crash-prone smartphones and has been considering regressing to a less-complex device such as the Centro. Despite claiming to know Ed Colligan from back in his days at Radius Corp., Mr. Berlind should be forewarned that the same version of the Garnet OS 5.4.9 is present on both the Centro and Palm’s recent Treo 755p. So the Centro will likely, for better or worse, exhibit identical stability, quirks, and performance to its older sibling device. If he's wary of "crash-prone" devices, he should drop kick that Treo! You can visit the mobile youtube site in the Blazer browser, and when you click on video links they automatically open and stream in an embedded kinoma player. Mike you can also download the latest version of Kinoma on any other Palm OS device (LifeDrive included) and get access to youtube and google video via the Kinoma Player. Correct me if I am wrong, Ryan, but from what I've gathered from various sources, the "improved" Blazer found on the Centro just updates the built-in bookmark listings and updates the embedded Kinoma player. There's actually no native YouTube or Flash support nor has it addresssed how pages are rendered or anything major like that. Ryan, did you catch a version number of the "new & improved" builds of Blazer & VersaMail on the Centro by chance? I think it's interesting to see them trying to position the centro as a gateway device between a dumb phone and a smartphone. I'm not 100% sure about that, since really, it's just a smaller treo - I don't know if it'll pull in too many new to smartphone users, but I suspect it might pull in some of the sidekick folks. Who knows.. But the real thing here, to continuously beat a dead horse is his talk about the Foleo. Why wasn't the Foleo developed as their next gen platform? Why'd the squander all the juice building something that wasn't going to be the next step for their treo cash cow? That's why Colligan should be fired. Well, there's lots of reasons, but that's probably the big one. Imagine if instead of cancelling the Foleo they had announced the next real step in PalmOS? <http://comments.deasil.com/> that is my tech blog. There are many like it, but that one is mine.